The joys of being pregnant – endless choices, suggestions and worries! Bun 2 Babe: Routines and Strategies for Nurturing Your Baby through Age Two: A Personal and Informative Guide From a Mother of Four gives you all the information you will ever need! Now take a deep breath. Modern motherhood is full of possibilities and Bun 2 Babe is here to help you navigate your options. While there are numerous parenting books available, not many present firsthand accounts of multiple methods in a uncompetitive way. After having four children herself, author Charlotte Ryan, B.Sc. Hon., B.Ed., MA, knows from experience that what is right for one mother or child is not necessarily best for another. Finally a pregnancy and parenting book that you will LOVE! Charlotte writes in an amazingly personal manner with humour and love for her children and being a Mother. You can easily connect with both her and her parenting style. She is honest and real, she doesn’t give you the story or product advice that you want but that you need. What I had to love the most was that Bun 2 Babe is not only great for first time parents but great for second, third and fourth time parents. Each pregnancy, delivery and first two years is different for every child. For my first son, I had a vacuum assisted delivery and it was quick and painless. My second son had to be induced and labour was long and painful. While my first son had difficulties with breastfeeding, my second son didn’t. Charlotte exposes you to every option out there from prenatal/antenatal care, to labour and delivery and raising your baby. When you have had four children, you have done and see it all! Her wisdom and experience truly shines out in this book. My favourite part was her own advice on how to remove those pesky boogers from your baby’s nose. I hated those nasal aspirators – they never worked. The only thing that truly works? Giving slight pressure on your baby’s nose by sucking on the end to pull it out. Yup – you have truly done it all when it comes to your kids! Talk about true love. Another favourite part of mine was the section on breastfeeding. While she does encourage you do breastfeed (she also gives you sections on bottle feeding so don’t be afraid! ), the best part was her explanation of the emotional connection. Too often we hear all about the health benefits but breastfeeding is truly beautiful. You feel so utterly connected (and not that I didn’t with my first son so please don’t take it the wrong way!) and time just freezes in that moment. I was reading this section while I was waiting for blood work and I actually started to cry in the lab’s waiting room. Bun 2 Babe is honest, real, full of love, humour and advice. Charlotte has a wealth of wisdom but speaks to you as another Mother who gets it. We just want to enjoy pregnancy and parenthood. We want the best for our baby but we also want to keep some sanity (say no to back zippers and buttons for infants!). This book is truly special and deserves to be on every baby shower must buy list. 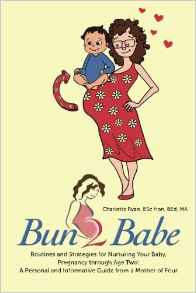 You can purchase a copy of Bun 2 Babe on Amazon. Charlotte Ryan is a busy mom of four fantastic kids and is a special education teacher. She received her master’s degree in education from the University of Toronto, and she continues to learn every day. Charlotte enjoys yoga, vegetarian cooking, skiing, horseback riding, painting, and exploring the outdoors. She lives outside Toronto, Ontario, with her handsome husband, cute children and big dog. You can connect with her on her site Bun 2 Babe. This entry was posted in book review, giveaway, parenting. YES!!! Most definitely! I had to calm myself even with my second child and remind myself of all the things that I did not need! Formula feeding. All the books I read talked about how breast milk was the best thing for baby and how it was rare for a woman not to breastfeed. But I, and my mother before me, didn’t get any milk with our kids. I just needed a resource that talked about formula as if it was not a second choice. I definitely think Gear for sure. I spent way too much on stuff I didn’t end up using and just ended up giving it away.